Combining advanced features and ease of use, the Minolta X-700 is very well suited to beginners and confirmed amateurs. The Minolta X-700 appeared in 1981. It was the last manual body of the japanese camera maker before it released the very first autofocus SLR body in 1985. It was a tremendous success. The balance between advanced features and ease of use attracted beginners and confirmed amateurs alike, as well as numerous clubs. Light and reliable, the Minolta X-700 owes its attractiveness to its three exposure modes : Program ("MPS", standing for "Minolta programming system"), aperture priority and fully manual. The Program mode contributed greatly to the success of this camera as it allows the photographer to concentrate on the picure while the built-in computer deals with the exposure. In all modes, the actual or recommended shutter speed is displayed in the viewfinder as well as the actual aperture setting in manual and aperture priority modes. The lightmeter is central-weighted. More simple and cheaper versions were made : the X-500 lacked the program mode while the X-300 lacked the depth of field preview lever also. 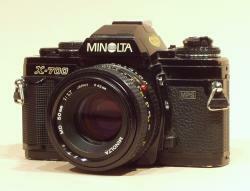 Lightweight and well built, the Minolta X-700 is very nice to use. The fingers fall naturally on the intuitive controls. The release button is very soft. The clear viewfinder displays all the essantial settings : speed, aperture, mode, exposure correction. The light meter is accurate and the three exposure modes allow to use the X-700 as a point-and-shoot camera or to take control of the least setting as well. The film loading indicator is a useful feature too. On the downside, when in manual mode the viewfinder displays the recommended speed setting and not the actual one. One has to look at the speed setting wheel to know it and the camera can be used in manual mode while the photographer believes it is in auto mode. All MC and MD lenses. The Program mode is available with MD lenses only.